I’ve always loved chocolate chip cookie dough. It’s like the flavor of a chocolate chip cookie only more intense. Plus, it has the fudge factor – it’s rich, dense, and so decadent. Whenever we buy a carton of Ben and Jerry’s Cookie Dough, you can always find holes burrowed out of the ice cream. That’s me picking out the balls of cookie dough. Once it got so bad, that I defrosted the container, turned out the entire container on a plate, and used a kitchen knife to cut it into slices. Then I picked out the cookie dough balls. 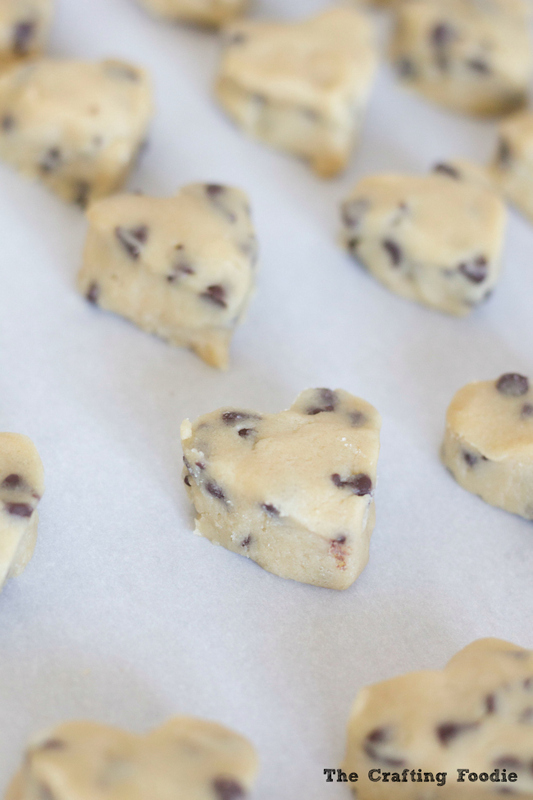 That’s when I realized that I need to make some Chocolate Chip Cookie Dough Truffles for Valentine’s Day asap! If you follow along at The Crafting Foodie, you’ll see that my trusty mini-heart cookie cutter has really gotten a work out this Valentine’s Day. 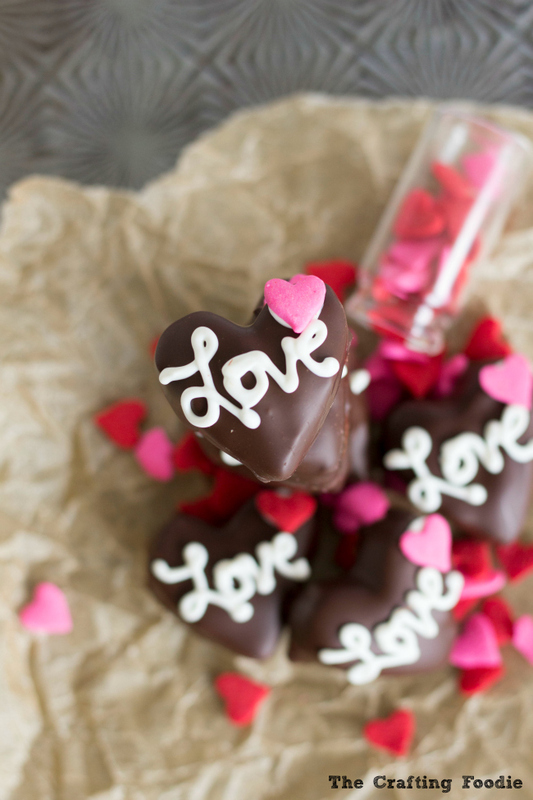 It started with these Sparkly Cupid’s Arrow Cake Pops. Then I used the cutters again for the sugar cookie decorations on this Valentine’s Day Red Ombre Cake. 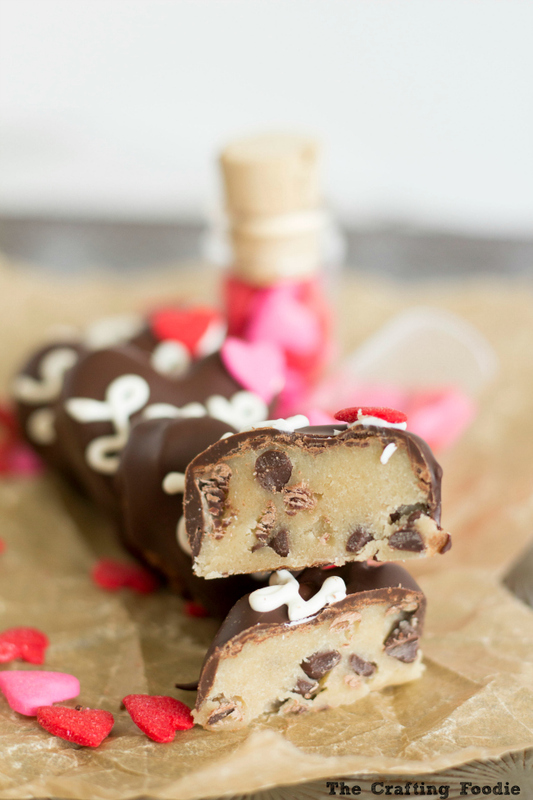 And now for these decadent Chocolate Chip Cookie Dough Truffles for Valentine’s Day. Some people like to roll out the cookie dough with a rolling pin and cut the shapes out. But I opt for the easier (or maybe lazier 😉 method of rolling out a chunk of the dough into a walnut-sized ball. Then flatten the ball so it has a flat top and bottom. Then I cut the heart shape out. The recipe I used for these Chocolate Chip Cookie Dough Truffles for Valentine’s Day is my favorite cookie dough recipe. It’s egg-free, and it doesn’t require any unusual ingredients. Some recipes call for condensed milk, but this one just uses plain old milk. The first time I made this recipe, I ate a quarter of the batter straight out of the bowl. That’s how delicious it is! For the chocolate topping, I simply melted dark chocolate. Then dunked the truffle into the chocolate. Once the entire truffle was covered and chilled, I did a little piping with some white chocolate. They could have easily been decorated with sprinkles, but I just couldn’t help making them a little fancy. While these Chocolate Chip Cookie Dough Truffles for Valentine’s Day are fancy enough to rival any box of chocolates, they’re a breeze to make. They are no-bake, egg-free, and you probably have all of the ingredients in your pantry. If there’s one last Valentine’s Day treat you make – make these Chocolate Chip Cookie Dough Truffles! These Chocolate Chip Cookie Dough Truffles for Valentine's Day are everything delicious about cookie dough. They're rich, packed with brown sugar, vanilla-goodness and mini-chocolate chips. 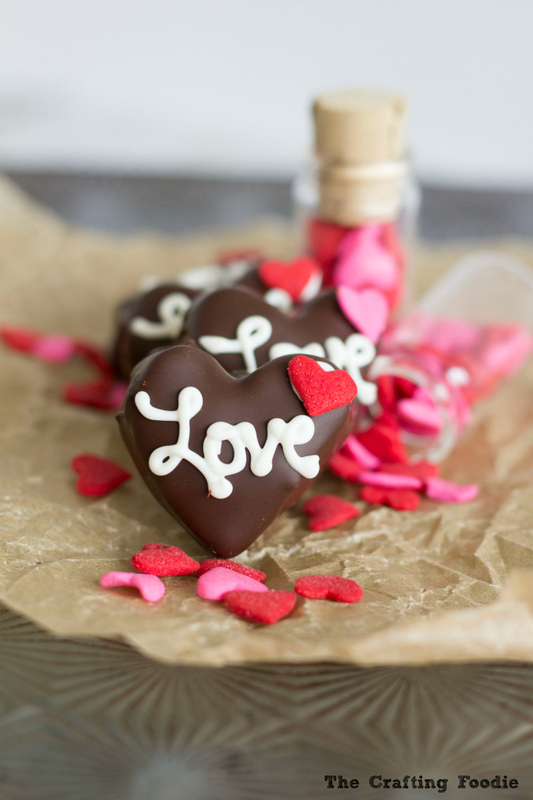 To make it just a little more irresistible, they are enrobed in dark chocolate. 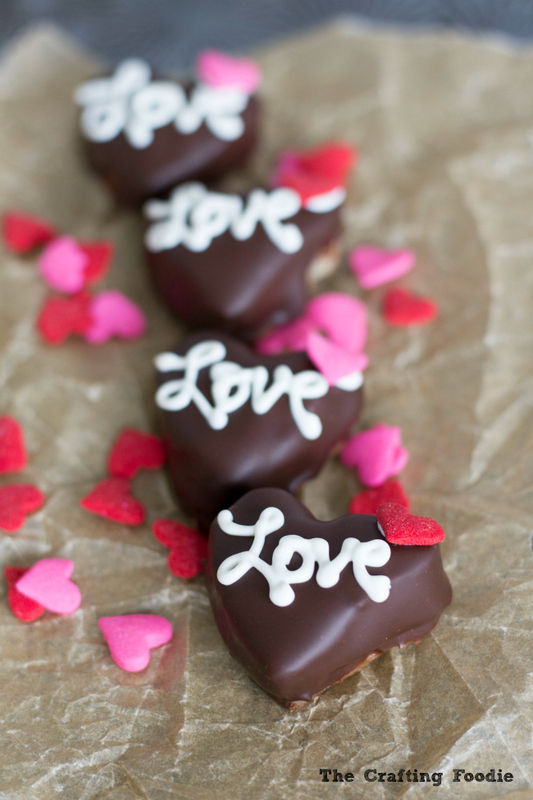 Plus, they are no-bake and completely egg-free making for a decadent, delicious, easy Valentine's Day confection. Mix the butter and sugars in the bowl of an electric mixer fitted with a paddle attachment. Beat until light and fluffy. Add the vanilla and milk. Mix until just combined. Add the flour and salt and mix until just combined. Roll the dough into a walnut-sized ball. Flatten the ball of dough. Using a small heart cutter, cut out a truffle. Place the truffle on a sheet pan lined with parchment paper. Continue the process until the entire truffle dough is cut-out. Refrigerate the truffle for at least 30 min. Dip each truffle into the melted chocolate. 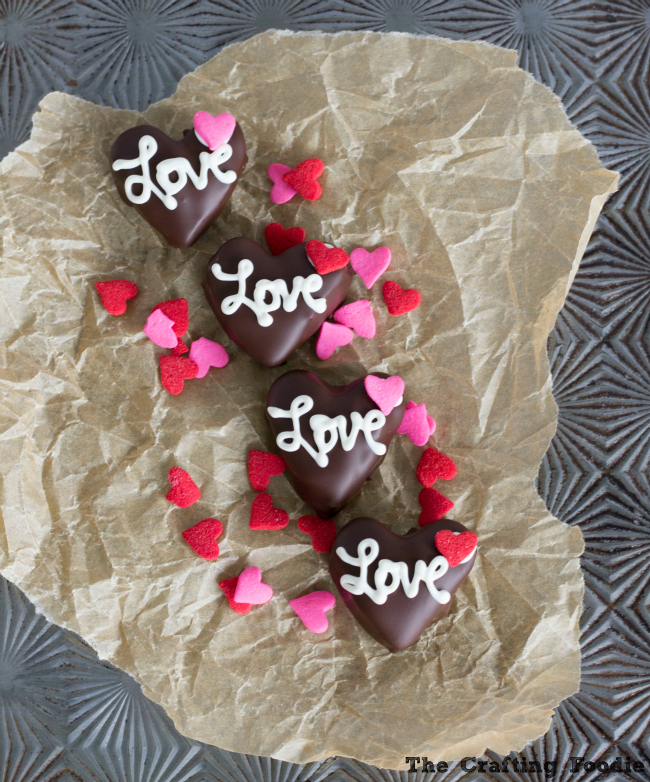 Place the chocolate covered truffle on a parchment lined sheet pan. Continue until all the truffles are covered. Chill for another 30 min. Place the melted chocolate in a zip top bag with the corner snipped off. Pipe out the word "love". These look so good and I wish I had one right in front of me! You did a great job decorating them…perfect for the holiday! These are so cute! My kiddos would love these, so I know what we are doing this weekend! My goodness, I gained five pounds reading that. The cookie balls are my favorite part in ice cream, too. The best part of this recipe is that it all contains quite normal, every day ingredients! These are seriously adorable!! They also seem relatively easy to make. I’m sure my oldest would LOVE these. Mmm these look so good! If I made them… I’m not sure I’d be strong enough to give them away to anyone! What a great and cleaver idea! They turned out so very cute! Your pictures turned out great. I loved how you decorated them. They look so very professional! Great job loved them! So pretty and they sound amazingly yummy. Pinned to my Valentine board! Woah- these look so good and are so adorable!! I love cookie dough too! These look amazing! These look SO good and your pictures are awesome! I can’t wait to try these, yum! I pinned these! They are just adorable. Those look incredible, but also kind of hard to make. Kudos to you, though.